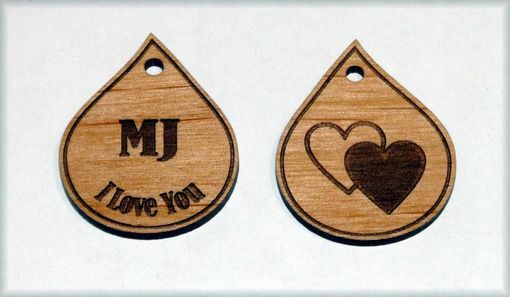 Charms with the words "MJ I Love You" were made. The wood charm is double sided with the inscription laser engraved on front and double hearts on back. 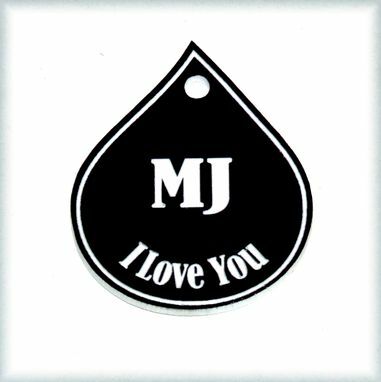 The flexible acrylic charm has only the inscription laser engraved. The wood charm is 1.5 inches high and 1/8th inch thick. The acrylic charm is 1.5 inches high and 1/16th inch thick. The charms have a mounting hole and can be worn from a necklace as a pendant or bracelet as a charm. The style of the charm is free style determined by the buyer.